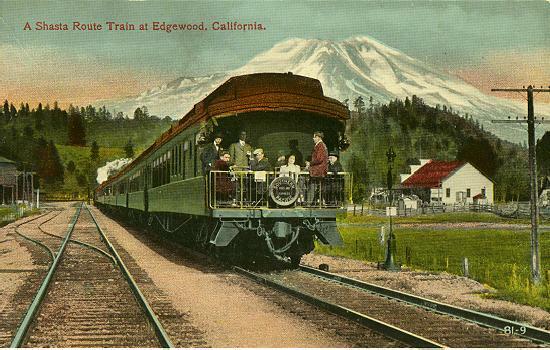 1 A Shasta Route Train at Edgewood, California. 2 Mt. 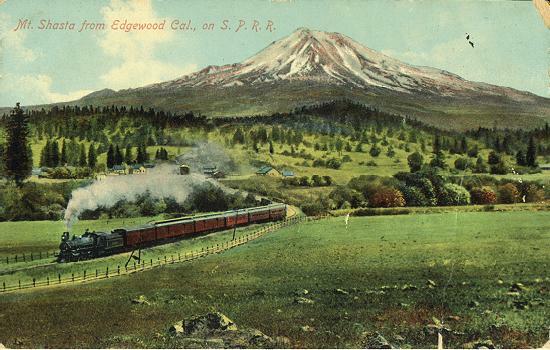 Shasta from Edgewood Cal., on S. P. R. R.
Published by M. Rieder, Los Angeles, Cal. No. 11853. 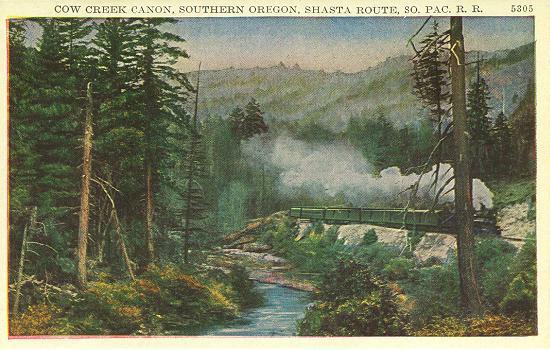 3 In the Siskyou Mountains, on the S. P. R. R. California - Oregon Route. 4 5324. 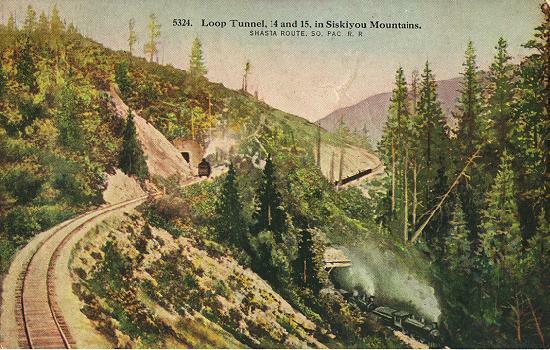 Loop Tunnel, 14 and 15, in Siskiyou Mountains. Shasta Route, So. Pac. 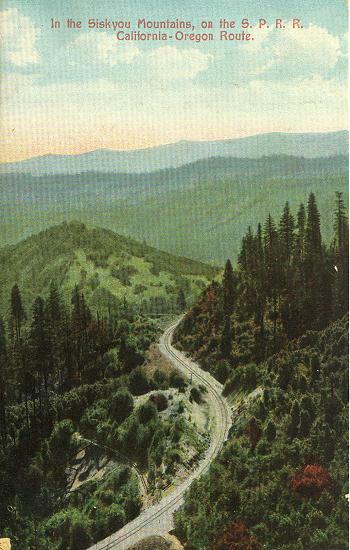 R. R.
Published by Newman Post Card Co. [Description on Back: "The journey into Oregon from California is accomplished by crossing the rugged Siskiyou Range of mountains. It is one continual succession of tunnels and cuts blasted out of the face of the mountain. The grandeur of the scenery is not to be excelled by any mountain road in the world"]. 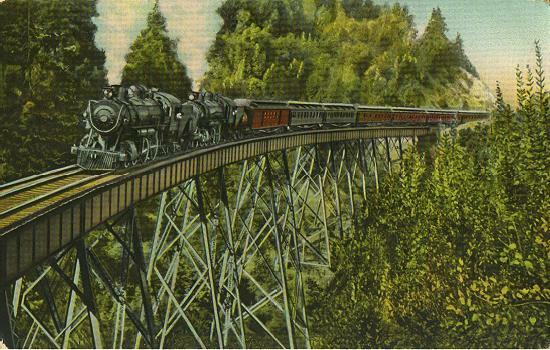 5 943 - Dollarhide Trestle, Shasta Route, S. P. R. R.
Message written but not mailed. Postmarked Jan. [day and year unreadable], Fairfield, Cal. 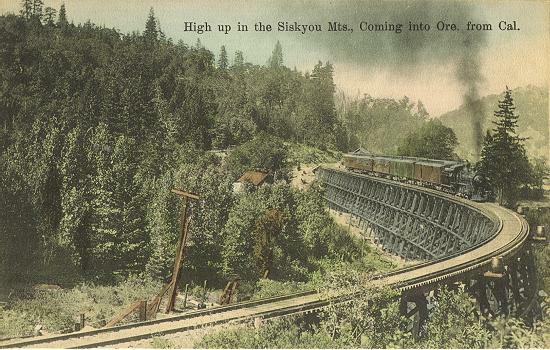 7 High up in the Siskyou Mts., Coming into Ore. from Cal. 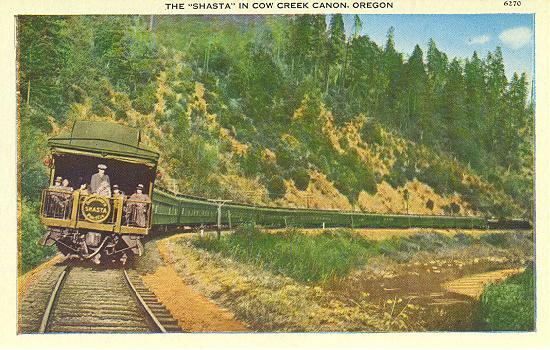 Published by Portland Post Card Co.
8 7633. 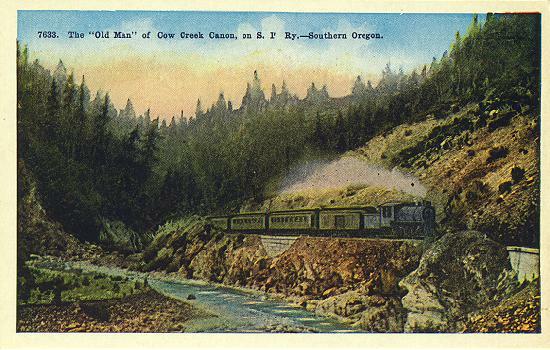 The "Old Man" of Cow Creen Canon, on S. P. Ry.-Southern Oregon. Published by Pacific Novelty Co.
9 5306. 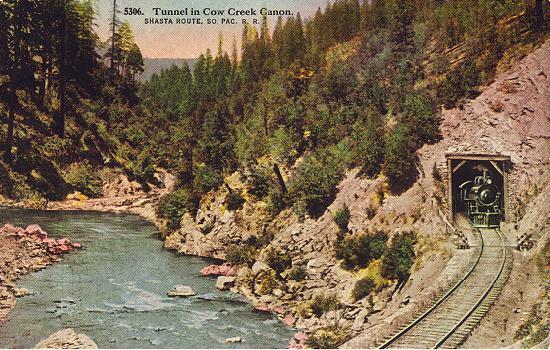 Tunnel in Cow Creek Canon. Shasta Route, So. Pac. R. R.
12 5305. 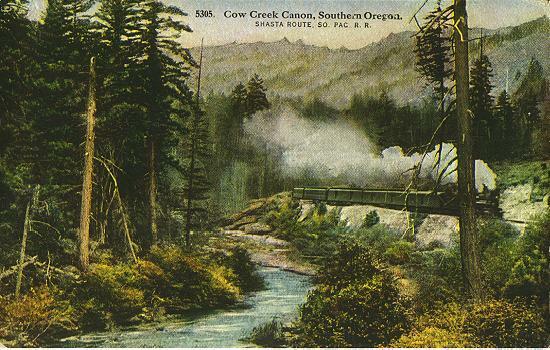 Cow Creek Canon, Southern Oregon. Shasta Route, So. Pac. R. R.
13 5307. 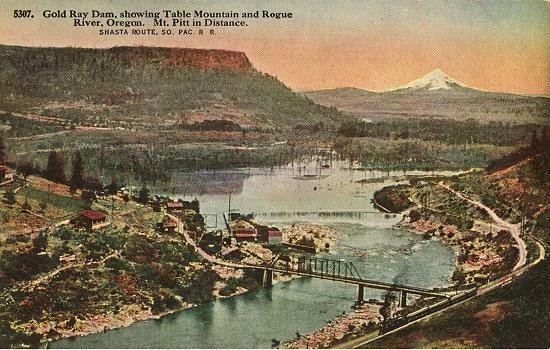 Gold Ray Dam, showing Table Mountain and Rogue River, Oregon. Mt. Pitt in Distance. Shasta Route, So. Pac. 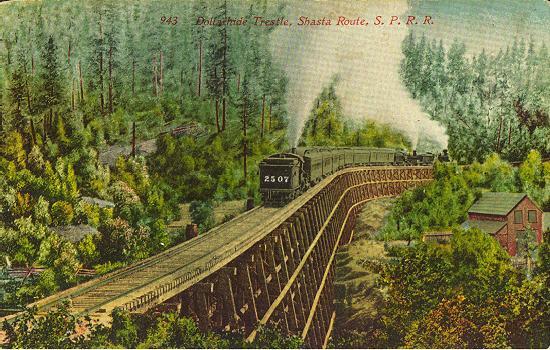 R. R.
[Descripton on back: "Not far from Medford, Oregon, on the line of the Southern Pacific is situated at the base of Table Rock, the famous Gold Ray Dam. At Table Rock it was that famous Captain Jack of the Modoc Indians made his last stand, was captured and hung at old Fort Kalamath, ending the historic Modoc war. The snow-capped Mt. Pitt, rising to an alititude of 9,760 feet, is one of the landmarks and best known of the numerous mountain peaks of Southern Oregon."] Mt. Pitt was renamed Mt. McLoughlin in 1905. 14 5308. 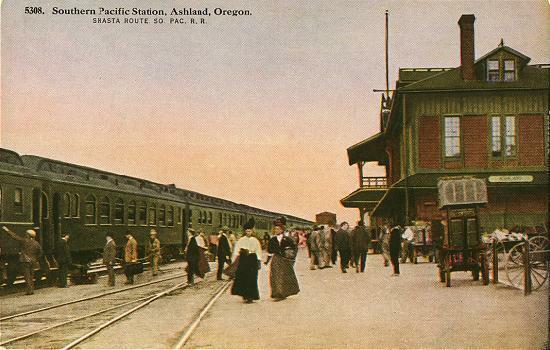 Southern Pacific Station, Ashland, Oregon. Shasta Route, So. Pac. 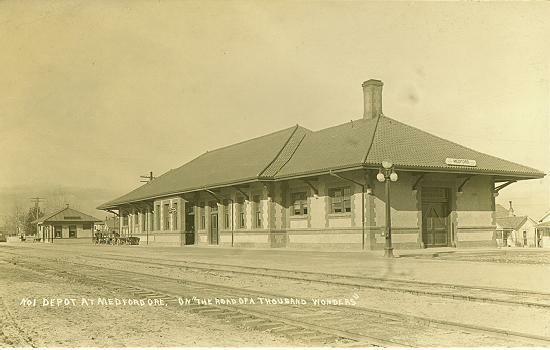 R. R.
15 1085 - Southern Pacific Depot, Ashland, Oregon. 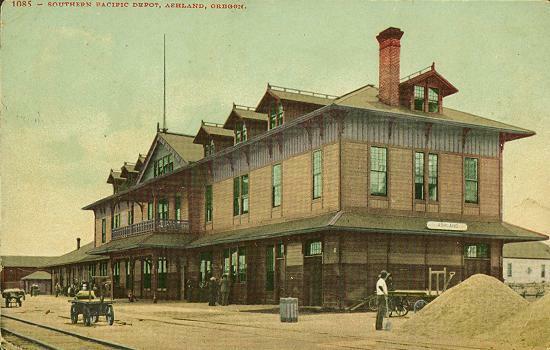 Postmarked Feb. 8, 1908, Ashland, OR. Published by Edward H. Mitchell. 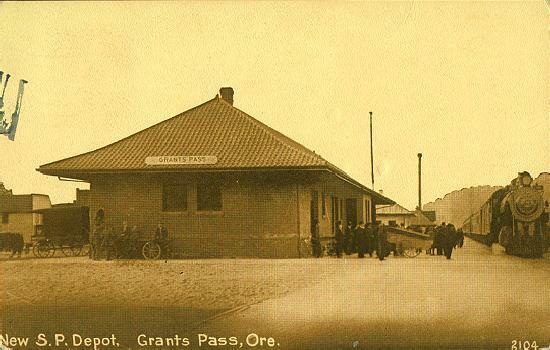 16 New S. P. Depot, Grants Pass, Ore.
Postmarked Jun 29, 1916, Albany, OR. 17 No1 Depot at Medford Ore, On "The Road of a Thousand Wonders"